The Herald’s report on the Sandgate celebrations in the supplement to the issue of 19 July 1902 covered such aspects as “Wednesday’s Enjoyable Events, Presentation of Mugs and Medals, The Children’s Procession, Bonfire and Torches, The Street Decorations,” etc. The bulk of the Herald’s report was devoted to aspects of the celebrations that centred on the children of Sandgate. “A procession of children in fancy dress marched from the schools to the ‘Encombe’ grounds.” The procession was led by the Hythe Town Military Band in their Volunteer Artillery uniforms, under Mr. Bandmaster Nelson. However it should be noted that later in the report there was a reference to “the band of the Folkestone Company of the Artillery Volunteers, under Bandmaster Nelson”, there were either two different bands or there was some conflicting information in this regard in the newspaper’s report. The two medals that I have here in Sydney were – I was told as a child – the gifts of the Sandgate U.D.C. in 1902, and in 1911 for the coronation of George V and Queen Mary. There used to be two coronation mugs in respect of both events in our West London family home at Gunnersbury, but they were no longer there when the house was sold in 2005. Other events, including the programme of music played by the Band during the Costume judging, were also reported in the press report. “A substantial tea was provided to the children … During the afternoon some sports were carried out,” for which monetary prizes were presented as detailed. The “List of Prize Winners” for the fancy dress competition was a major feature in the Herald report. It was arranged under categories as was the List of Entries. However there are some discrepancies among those Lists, not surprising when one considers the number of children involved and the multiplicity of events. 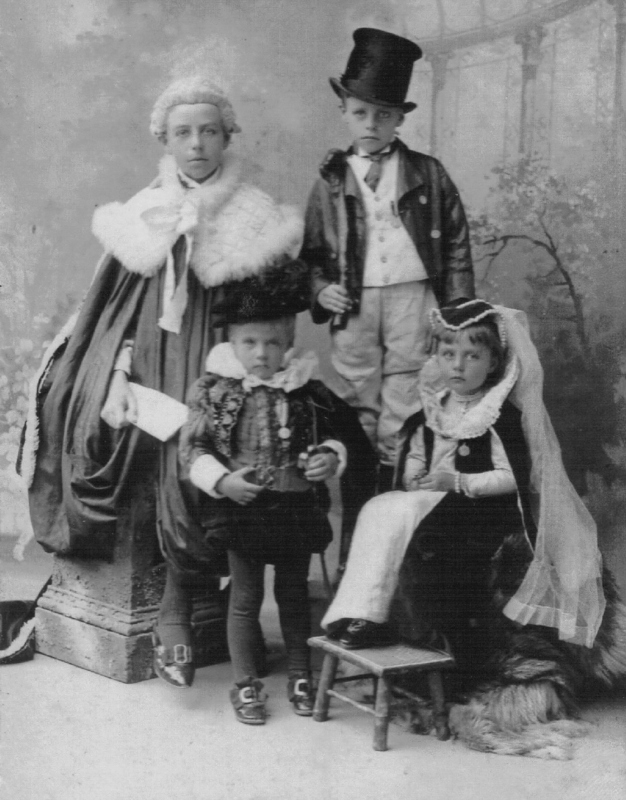 Below are three photographs of four of the Prescott children, who lived at this time in The Rosary, 31 Esplanade, Sandgate – not so “named” in the Sandgate Section of the Folkestone Directory until the issue of 1903/4. 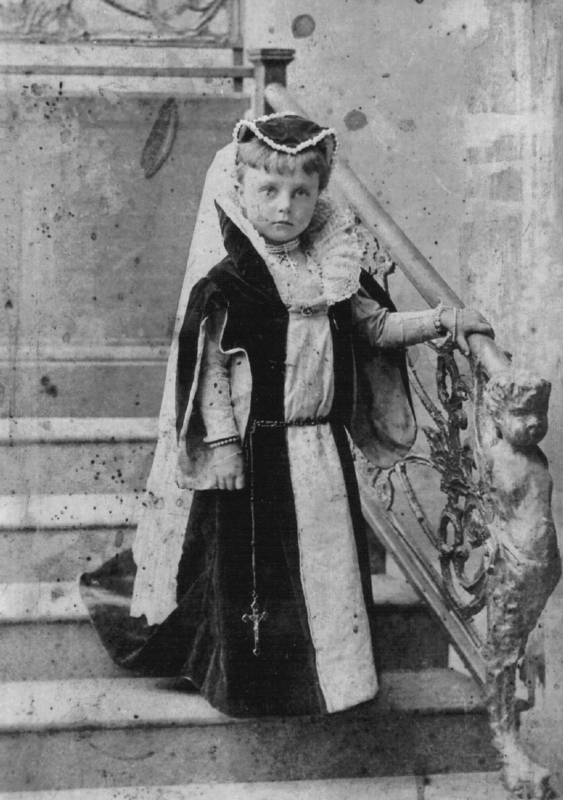 The photographs show the children in their Fancy Dress Costumes for the procession and competition and were taken in the premises of W.H. Jacob. Original copies are held by various descendants of John and Annie Prescott. We can remember – as children – that there were hanging in the garden sitting room in the front of The Rosary enlargements of two of there photos, which were regarded as family treasures. Post-1945 those enlargements had disappeared. The first photograph shows the four Prescott children old enough in 1902 to take part in these events. From left to right at the back – John (Jack) Prescott (1886-1967) as the Lord Chancellor (for which he won 2nd prize – 7 shillings and 6 pence – in the Trade or Profession Competition for Boys), with James (Jim) Prescott (1891-1878) as an Irishman (no prize). 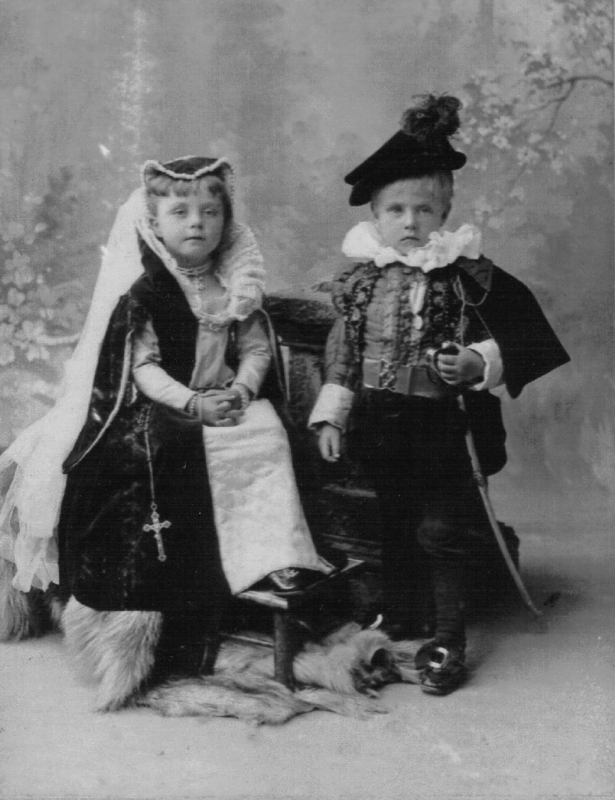 From left to right in front – Annie Honora (Molly) Prescott (1897-1985) as Mary Queen of Scots (for which she won part of the 3rd prize – 5 shillings – in the Historical Dress Competition) and William (Bill) Prescott (1899-1978) as Lord Darnley, (for which he shared the 3rd prize with his sister Molly). There was also a Competition for “Decorated Mail Carts” in which the 3rd prize (no sum specified in the Herald report) went to Mrs. Prescott. I am not sure what a Decorated Mail Cart was or is, but somehow I have the feeling that my Mum (May Eileen Prescott – 1901-1953) was sitting in the Mail Cart. The second photo shows Molly Prescott and Bill Prescott in their character costumes. The third and final photograph and probably the most iconic Prescott photo of this event shows Molly Prescott alone. When she (Molly Bloxham, née Prescott) gave me an original copy of this photo in 1970 she told me that poor Mr. Jacob, the photographer, had the greatest difficulty in taking the photo in this pose as she would not stay still for long enough. So in the end he tacked a nail into the train of her dress and if one looks closely at the photo one can see the head of that nail on her right hand side in the third step from the bottom.